The Guru Randhawa India Tour will see attendees grooving to his popular tracks including 'High Rated Gabru' which reached 345 Million+ views, 'Ban Ja Rani' from the movie Tumhari Sulu, 'Yaar Mod Do', 'Patola', 'Fashion', and 'Lahore'. He made his Bolllywood singing debut with the movie "Hindi Medium" with the song Suit and is highly trending with youngsters across social media platforms. Guru Randhawa has bagged the award category of "Best Male Debut" at the PTC Music Awards 2014 and in another category of "Best Duo Song" at the PTC Music Awards 2016. Along with popular numbers from the sensational Punjabi hit-maker Guru Randhawa, Bollyboom also promises a completely new twist to this genre of popular music to create a unique live entertainment experience for Bollywood music fans across the globe. The audience will also witness live percussionists, exotic performers and a jaw-dropping experience combined with visually mesmerising SFX and state of art Technology. The event will offer a curated F&B and seamless experience for all attendees making the overall India Tour a grand success. Guru Randhawa, singer and song writer said, ''It's been a great year for me with multiple number one hits. I love performing Live and engaging with my fans on-ground. The 9 city Bollyboom tour is one of the most extensive tours that I have done in recent times and I'm really looking forward to it. I'm expectinghighlevel of energy and love from my fans and hope to make each show memorable. See you in your city soon''. Jasvinder Singh, CEO Acapella Production commented, we at Acapella promote Music and manage the very talented Guru Randhawa. I believe there is massive scope of talent in India and my motive is to promote New Talent worldwide and add my contribution to world's music. We are very exicited for this 9 city India tour with Bollyboom and hoping to extend this tour around the word. Commenting on Bollyboom India Tour with Guru Randhawa, Manuj Agarwal, CEO - Percept Live commented," Bollywood infused with the beats of Electronica", is a phenomenon that's only growing and getting more popular since its inception. The EDM genre, with its revolutionary cutting edge digital sounds and melody, has grown massively in popularity and become the prime music choice of 'screenagers' today. And Indians have always been hooked to the melodies of Bollywood music. Combining the two in our IP 'Bollyboom', along with a larger than life on ground experience is a win-win combination for both Bollywood and EDM music aficionados. The Bollyboom Tour with the popular and talented artist Guru Randhawa will offer a unique and mesmerizing taste of Bollywood Dance Music that's going to take this genre to the next level of the charts." Bollyboom is an existing Intellectual property, which belongs to Percept Live, a forerunner that introduced a new genre called Bollywood Electro Music, a fusion of Bollywood music and electronic sounds in the festival market in India since 2013. The first editions have seen live performances by Sonu Nigam, Salim-Sulaiman, Shaan, Shveta Pandit, Shraddha Pandit sharing the platform with DJ Lloyd, DJ NYK and Acid in various cities such as Mumbai, Delhi and Jaipur. In the second edition, Bollyboom did events such as Bollyboom Holi Bash 2017 and another in 2018 with an accumulative attendance of over 10,000. Another massive event called Bollyboom NSCI Nights which pulled a crowd of over 4,500 Bollywood music enthusiasts with DJ Raftaar, DJ Aqeel, DJ Shilpi Sharma, DJ Zulfi Syed and DJ Aman who rocked the NSCI Dome at Worli In 2017. Last year Bollyboom hosted a pop up party offering customers a unique fresh and an exclusive nightclub experience, along with an exclusive guest list and an unforgettable experience at Marriot in Mumbai. Apart from arenas and Pop-ups Bollyboom has hosted multiple club nights in various metro and tier 2 cities. 'Bollyboom' is known to provide a unique live entertainment experience for Bollywood music fans and is seen in different variants across the country. 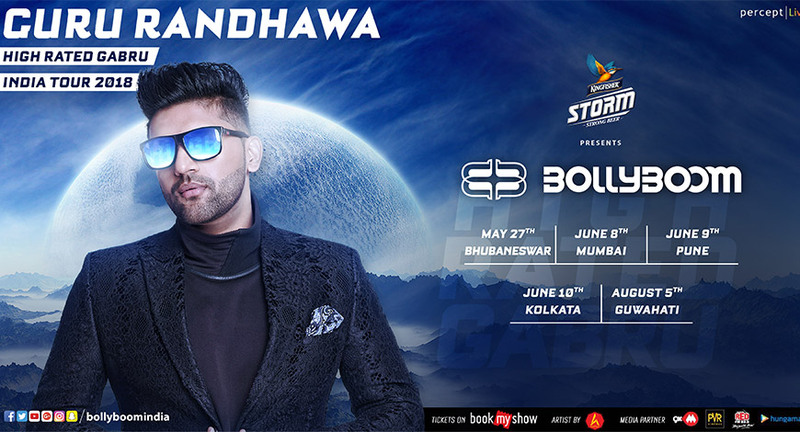 The Tickets for Bollyboom India Tour with Guru Randhawa goes live on1st May 2018 on bookmyshow.com at 12 PM IST.